Have you ever been so far behind on something you forgot about things? Well, yeah, when I was having issues with my gallbladder, before I had it removed, I had a lot of stuff ready to post on the blog, and then it kind of fell by the wayside... these Julie G Candy Shoppe Colors are the perfect example! I bought them, wore them, took the pictures, then forgot about them. And they've been hanging out in my blog folder ever since. So it's high time I showed them off, right? :) These polishes have a "jelly bean finish," which isn't quite matte, and it's not quite glossy - it's kind of a waxy feel. You should've known Candy Shop, this gorgeous orange, would be my favorite, right? It's a gorgeous, juicy, shiny orange. It looks perfect! I used 3 thin coats for what's pictured. Photos are in natural indoor light and artificial light. Lemon Drop is a very pretty, bright yellow. The formula on this one is a bit thinner than the rest, but it's not horrible. I used 3 thin coats for what's pictured. You can still see some VNL, but it's not apparent. Wild Cherry is a very pretty, very candy-like red. It looks like a juicy cherry, right? This one is only 2 medium coats. There are 2 purples in this collection, and this one is Lolli Pop. This one is the more pigmented of the purples. I like it, but I'm thinking I could have used another coat, Pictured is 3 thin coats, but you can see a bit of patchiness. The pink of the collection is Pixi Stick, and it kind of reminds me of a strawberry shade. It has very good pigmentation. I used 2 medium coats for what's shown. Sweet Tooth is a powdery sky blue, and it's so pretty! The pigmentation affords this polish 2 thin coats for opacity. The other purple is Sour Grape, and the pigmentation on this one isn't as strong as the others. You can see in my swatches that 3 thin coats really wasn't enough. I'm thinking of trying this one with some layering options - maybe a jelly sandwich? This green is called Sour Apple, and it's the sort of green that is kind of light, yet... dark? haha It's not pastel, and it's not minty. It's sort of a grass green. 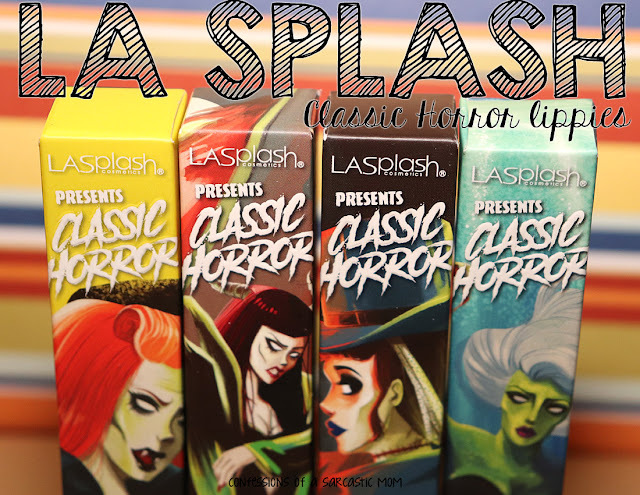 The formula is nice, but the pigmentation is on the lighter side. I used 3 thin coats for what's pictured. And last, but not least, is Licorice Twist, a black shade. It reminds me of black jelly beans, and I don't like them! haha But I do like this polish. I used 2 medium coats, but I think maybe I needed 3 thin coats; there's still some patchiness. 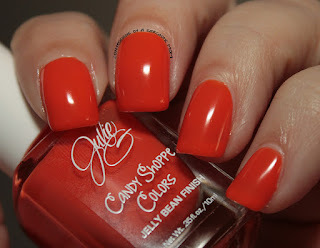 Do you have any Julie G polishes? You can buy these (and all Julie G polishes) at Rite Aid or on the Jesse's Girl Cosmetics website. Price point is $3.99 each, or you can get the whole set. I have a LOT of Julie G polishes, and I love them all. Some of the best quality polishes in my collection.